With Hurricane Irma hitting Atlanta on Monday, Delta's Airport Customer Service team solicited support from non-frontline employees through the airline's Peach Corps. The volunteer program assigns administrative personnel to customer-facing roles in the operation. "We have over 100 volunteers coming out to support the operation today," said Mike Flegal, an ACS field support employee who ran the Peach Corps volunteer process at the Atlanta Airport on Monday. "With public transportation closed in Atlanta, lots of the vendors who support our wheelchair service couldn't make it to work, so a big focus of our support has been meeting customers with wheelchairs." Peach Corps volunteers are helping with everything from wayfinding and general check-in processes in the lobby to assisting with the Need Help Center support along each of Atlanta's concourses. 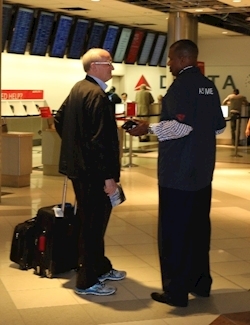 Following the last irregular operation, Delta enhanced the program to ensure that leaders are available to assign tasks throughout the airport. It also created a database of skilled volunteers with experience working flights who could be assigned to more specific tasks. One of the most notable differences in the Peach Corps activation was the use of NOMAD. This handheld device was built to support the frontline and to enable flexibility in situations such as inclement weather. Today, they were used to create extra boarding lines, reroute luggage and support customer questions about their travel itinerary. Additionally, volunteers helped prep catering for international flights. With the high winds, the catering trucks weren't able to lift up planeside like they usually do. 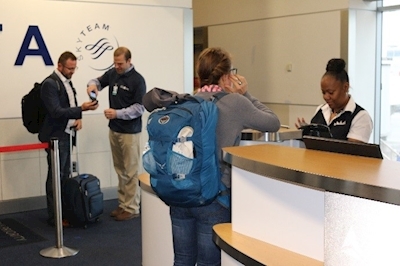 Delta teams pre-positioned headsets, amenity kits and more to ensure flights could be provisioned. But the Peach Corps wasn't the only relief for the hardworking Atlanta team. 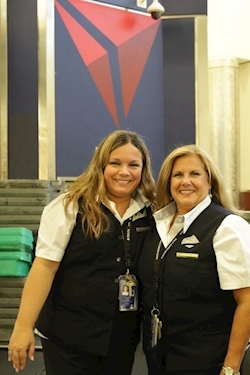 A number of agents from stations not affected, including Syracuse-based Amy Blakeman and Debbie Tortora (pictured below), flew in to Atlanta from Syracuse to support their colleagues. It was their first time traveling to assist in an IROP. Tortora said she thought the program defined the Delta culture, saying, "It's a wonderful program that gives you an opportunity to help. This is truly my Delta family." "The Delta Difference shines through in challenging times and we deeply value this world-class team," he said. "Delta teams have been battling the elements in the Caribbean and throughout Florida – not only taking care of our customers but going above and beyond to help their Delta family. As Hurricane Irma now heads toward our Atlanta headquarters, people from across the company are joining the hardworking Atlanta team on the frontline to help Delta recover quickly." Skilled Peach Corps volunteers and Airport Customer Service relief crews will be placed in impacted stations throughout Florida over the next few days to help Delta recover.